The world of food processing and plant management is becoming more and more complex every day. Rapidly growing production demands and increasing pressures around food safety and regulatory compliance are forcing many companies and plants to reevaluate staffing plans and skilled labor needs. The problem is, the talent pool across the industry is shrinking and employee turnover continues to be disproportionately high compared to other industries. Research from the Korn Ferry Institute reports that by 2030, the global talent shortage could reach 85.2 million people—costing companies trillions of dollars in lost economic opportunity. The labor issues result in costly production disruptions and scheduling changes. But more importantly, it puts processors and its consumers at risk for potential food safety issues without the right experts and trained professionals overseeing daily operations. Food safety and sanitation is a demanding, high-risk business that requires a team with specific education and training across a variety of specialized areas (chemistry, engineering, microbiology, technical design, etc.). Not only to manage the day-to-day sanitation operations and regulatory compliance, but also to lead emergency food safety situations, such as a deadly listeria outbreak, that can be catastrophic for a brand. 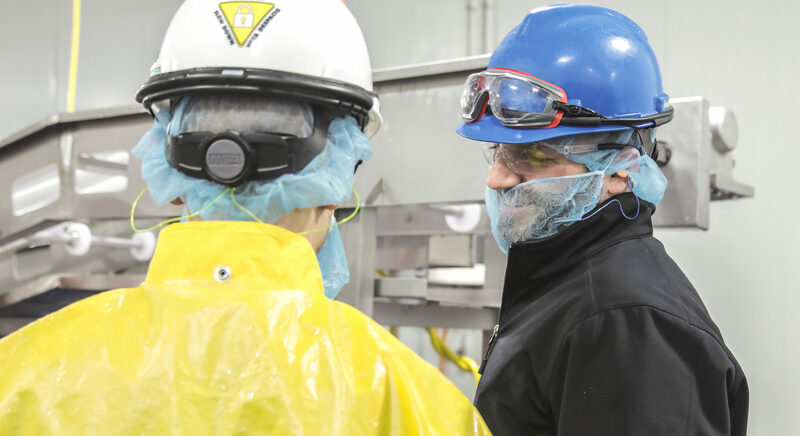 Investing in a specialized food safety partner who already has the expert resources can save time and money, avoiding internal recruiting and training issues and ensuring safe, on-time production schedules. However, in an industry that has also experienced its share of turnover and labor issues, it is important to ask questions and understand the company’s culture and employment practices when evaluating potential food safety partners. How do they recruit employees? What processes do they have in place for onboarding new employees? What programs do they have in place to help retain employees? How are employees engaged and committed to producing quality work? How are employees rewarded or compensated for good work? The core of the company’s success is its Employee Retention and Development Program (ERP), a customized new hire training and development program developed in-house by the PSSI leadership team. It is the foundational building block of the company’s culture to provide a premier level of service to its partners. The focus of the ERP is to ensure every PSSI employee feels valued and motivated to learn and grow. Every detail of the program is intentionally focused on training and/or connection (relationship). Here are some of the key elements that define PSSI’s ERP and strategy for building a productive and engaging workforce. Guarding the Front Door – PSSI is selective in its hiring practices. The company not only has defined strategies for how to generate a consistent flow of quality applicants, but also effective screening criteria to find the right candidates. 24-Hour Experience – PSSI defines the first day as one of the most important experiences to support long-term engagement and success. The company has key criteria for creating a positive and memorable experience for every employee on their first day. New Hire Qualification – Statistically the first 30 days of employment is the most critical time period for every new hire, regardless of the industry. PSSI has an intensive four-week training program that integrates HR, Operations, Safety and Food Safety priorities to acclimate new employees. Every new hire is assigned their own personal trainer/mentor to help support them through the training process. Following the 4-week training, each employee is evaluated based on five key performance criteria that determines if they move to the next level of the company. This qualification achievement is recognized with a team celebration and a transition from a tan to a white colored hard hat to signify they have successfully completed the ERP program. Selection and Development of Trainers – PSSI also has a program dedicated to advancement opportunities, selecting and training high performers to become the ERP trainers/mentors for new hires. Once identified, these trainers are included in a 26-week training program that provides a deeper understanding of the basic disciplines of the food safety business. Sustaining the Culture – PSSI has an uncompromising commitment from the CEO to every level of plant leadership to the ERP program. Every level of PSSI’s plant leadership team participates in weekly meetings to ensure that the ERP focus remains a priority in every plant companywide. The future of food safety is all about the quality of people behind the scenes working to protect it day in and day out. As production demands and compliance complexity continue grow, so does the need for more experience, specialized support to ensure quality and consistency. The investments made today will play a key role in your success of tomorrow.